I don’t know what it is, but there’s just something comforting about sitting down with a big bowl of noodles…. Don’t get me wrong, I love Rice, and I adore Potatoes, but sometimes you JUST – NEED – PASTA! 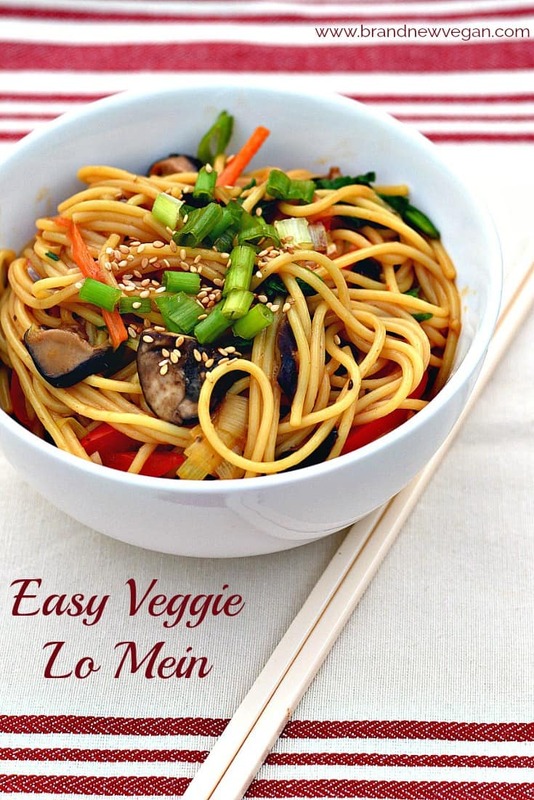 Like this incredibly easy Veggie Lo Mein. 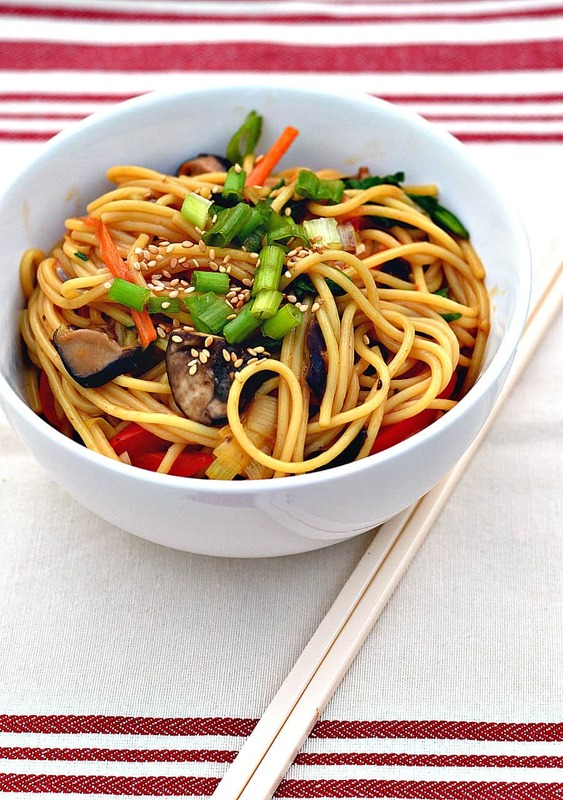 What happens when you drop warm, chewy noodles into a bowl of crispy, stir fried veggies? And then smother the whole thing with a tangy Asian Stir Fry Sauce? And you don’t need to be a 5-star chef to pull this one off either. Mix a few ingredients together to make the sauce. As they say – easy peasey. Grab your wok and let’s get cookin’ ! The sauce is very easy to make, and full of that amazing Asian Stir Fry flavor. In a saucepan, we’re going to mix Veggie Broth, Soy Sauce, Ground Ginger, Minced Garlic, Brown Sugar, and Lime Juice together until it begins to simmer. I like to add a little Chili/Garlic Sauce too – just for a little spiciness. Don’t worry, it’s not ‘burning off your lips’ spicy…. just a little zing. When it’s bubbly – stir in a little Corn Starch slurry to thicken and set aside. Literally takes like 5-10 minutes for the sauce. Now that the sauce is done, go ahead and boil up some noodles. Typically, Lo Mein noodles are kind of thick, so I simply used Spaghetti Noodles which worked out great. If you’re avoiding ‘white pasta’, look for 100% Whole Wheat Noodles instead. Prepare noodles according to package instructions, drain, rinse, and set aside. For the veggies, you can use whatever you happen to have on hand, just be sure and chop them uniformly in size. I used a Carrot that I sliced into matchstick sized pieces, a Leek, a Red Bell Pepper, about 4 oz of Mushrooms that were leftover from the other night’s pizza, and about 4 oz of Shiitake Mushrooms. You could also add Bok Choy, some shredded Napa Cabbage, whatever. Stir fries are VERY forgiving. Stir fry the veggies over medium-high heat in the pan of your choice, although I recommend a good wok. If you need a little liquid to keep things from sticking – use veg broth, water, or a few shakes of Soy Sauce. When the veggies have cooked down a bit, toss in your drained noodles and give it a good stir. I also added a couple of handfuls of Baby Spinach at this point – and then poured on the sauce. By the time you’ve got the sauce mixed in really well with the noodles, the spinach will have wilted leaving you the most Luscious Veggie Lo Mein you’ve ever seen. 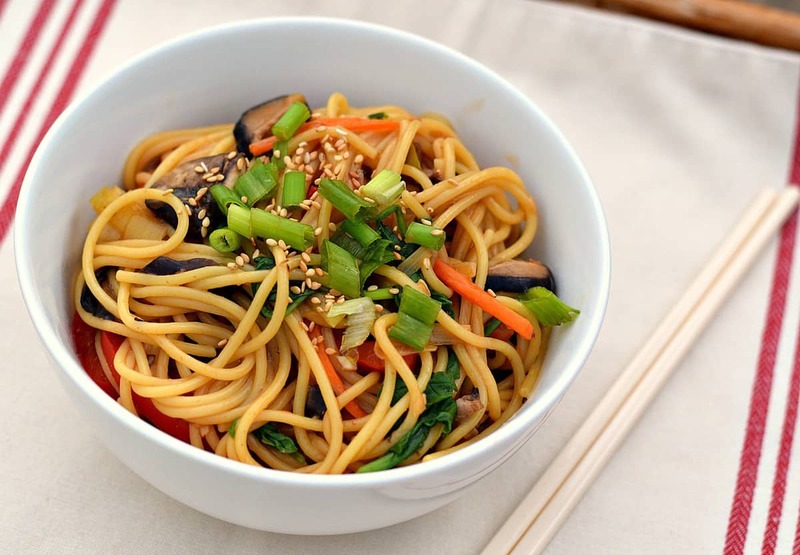 I don't know what it is, but there's just something comforting about sitting down with a big bowl of noodles.... like this incredibly easy, fat-free, Veggie Lo Mein. There are numerous Chinese takeouts where I live and every single one of them uses spaghetti (probably because of cost) and it tastes just fine. I can’t remember the last time I saw lo mein noodles outside the supermarket. Pinned and shared. 🙂 I’m not familiar with chili garlic sauce. I’ll have to look for some! My family likes the popular Sriracha sauce. Perhaps you meant 1 tsp of lime juice and 1 TBS of brown sugar????? Loved this recipe. Turned out very delicious! I love brown rice noodles.